﻿ Conneaut West Breakwater Lighthouse - Ohio. Find It Here. 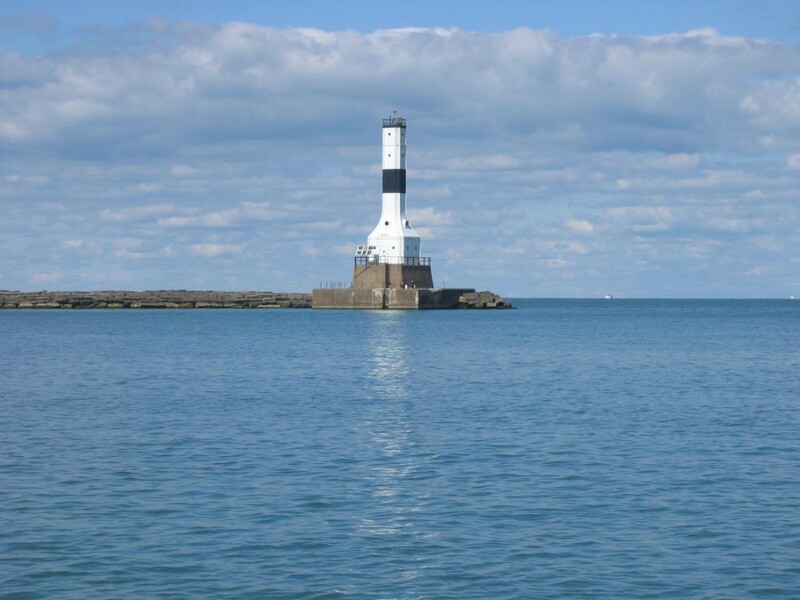 The Conneaut Lighthouse is a major land mark in Conneaut and Ashtabula County. The superstructure is a reinforced concrete building two stories in height with a tower rising in northeast corner. The cellar contains oil-storage tanks and other storerooms; the first floor provides a power room, kitchen, office and supply room; the second floor contains the water tanks, air receivers and a bedroom and the diaphone apparatus is placed in the tower. The light was placed in commission September 15, 1920, and the fog signal went into operation April 15, 1922. It can be easily viewed from anywhere in the Port of Conneaut. Parking is easily available to view the lighthouse. Kayaks and jet skis available for rent.